This week, the first beta of the Star Control reboot is unleashed on an unsuspecting universe. 25 years ago, Accolade released Star Control II. Back in 1992, Accolade was a major game publisher. Some of the best games of all time came from them, including Test Drive, Power at Sea, Hard Ball, Steel Thunder, and many, many other games. During the late 80's and 90's, they were a match for Electronic Arts and Activision. Eventually, Accolade was acquired by Atari. 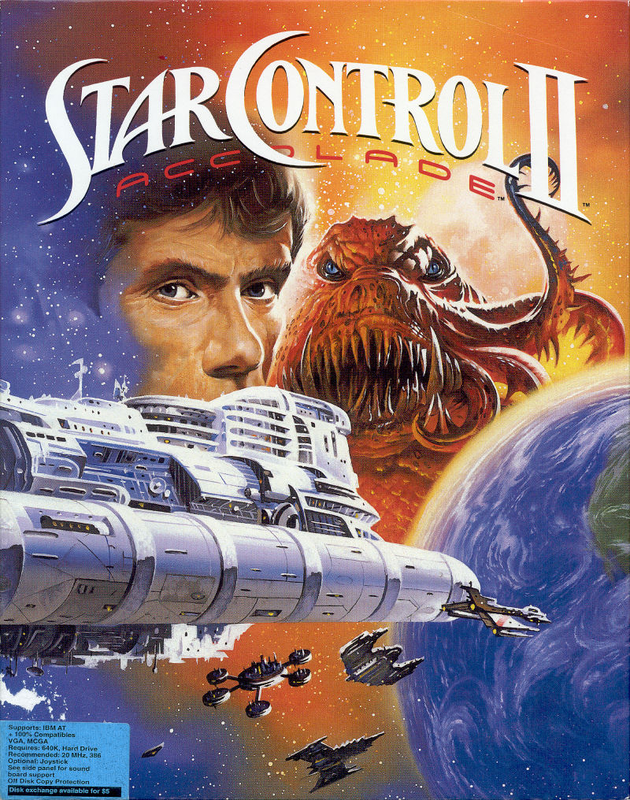 Stardock acquired Star Control from Atari in 2013. 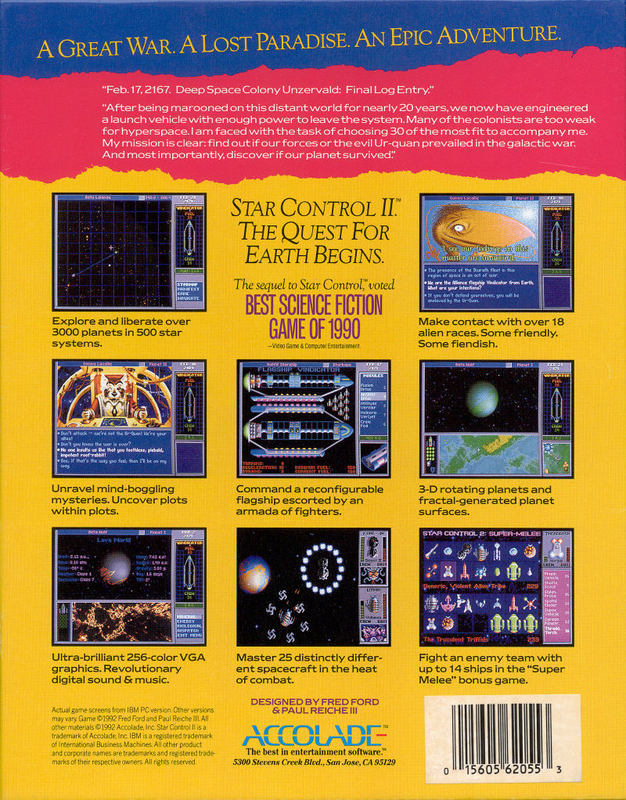 But, 25 years ago this month, Star Control II was released making gaming history. Many fans are familiar with Paul Reiche III and Fred Ford's contributions to Star Control II. Paul was the guiding hand and mentor while Fred was the programming genius. After Star Control II, they would go on to form Toys for Bob, which was later acquired by Activision. But Star Control wasn't the last thing they worked on of note. They led the team that made Skylanders, which you may have heard of. What most people may not realize is that the team who made Star Control II later went on to create other things that you are probably quite familiar with. These legends came together in a moment in time and created one of the greatest games ever. Let's take a look at some of the industry legends who teamed up to create Star Control II. Greg Johnson, who designed the Starflight series, worked on Star Control II. He also worked on Deluxe Paint! He later joined Electronic Arts back when it was only a couple dozen employees and worked on the Adventure Construction Set. He also was the lead on ToeJam & Earl. Today, he leads HumaNature Studios. Mat Genser and Robert Leyland also worked on the writing for Star Control II and have gone on to have careers in games and movies. Speaking of movies, Iain McCaig, who worked on Star Control II as an artist and writer, is an industry legend today in movies and film. 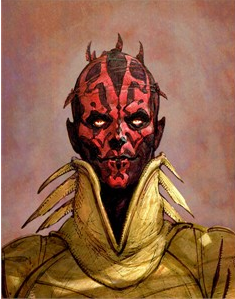 He designed Darth Maul and countless other Star Wars characters. Recently, he worked on character designs for Star Wars: The Force Awakens. He also worked on Terminator 2, Harry Potter and the Goblet of Fire, the Avengers and Guardians of the Galaxy. You can find more of Iain's Star Wars related work here. Another writer on Star Control II was John Estes, who went on to work in the film industry and today is an active producer and director of documentaries. Prominent science fiction artist, George Barr, also contributed his work to the art of Star Control. He was best known for those "pulpy" sci-fi images you'd see on book covers. George Barr was the artist behind many classic science fiction scenes. If you want to see more of his work, visit here. Another legend, Erol Otus, was one of the leading artists on Star Control II and was even the voice of the Chmmr. 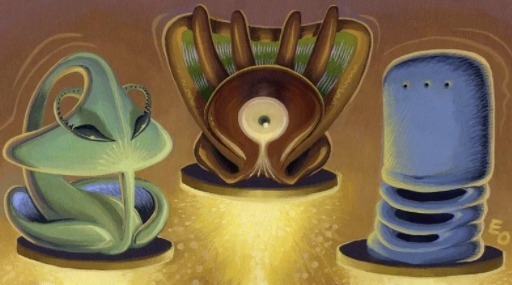 Artist Erol Otus may be familiar to you from his work in Dungeons & Dragons, as well as his art in Star Control II. Erol Otus also did music for Star Control II as well. Here's a fantastic interview with him. Erol Otus designed the Zoq-Fot-Pik for Star Control II and is also known for his D&D fantasy art. Kyle Balda worked on animation for Star Control II. You may not recognize his name, but you've seen his work. A lot. 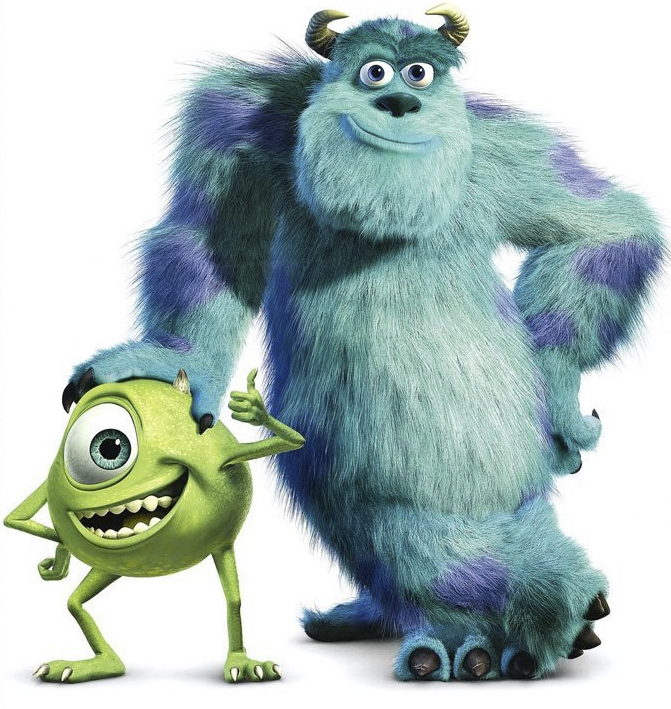 He is the director of Despicable Me, Minions, The Lorax, and led the animation department on Monsters, Inc.
You've seen Kyle Balda's work somewhere besides Star Control II we suspect. Another legend who was part of the art animation team was Greg Hammond. Most recently, he produced The Secret of Monkey Island: Special Edition. Before working on Star Control II, he was a producer on Loom and Wings of Fury. After Star Control II he went on to work on games such as Star Wars: X-Wing vs. TIE-Fighter. Armand Cabera was the artist who designed and created spaceship art and the spaceship animations on behalf of Accolade and Toys for Bob, and has gone on to have an amazing career. This is by no means a complete list of the men and women who worked on Star Control II. 25 years ago, Star Control II served as a nexus of amazing talent. For a full listing of the Star Control II team, visit the credits page. It is no secret that Star Control was influenced heavily by Starflight. Starflight's lead designer, Greg Johnson, helped write the dialog for Star Control II. David Brin's science fiction series about the Uplift Universe and Larry Niven's Known Space universe were influential in creating the setting. In the Uplift universe, a patron species will genetically modify a pre-sapient client species until it is sapient and then have it serve the patron for a period of time. 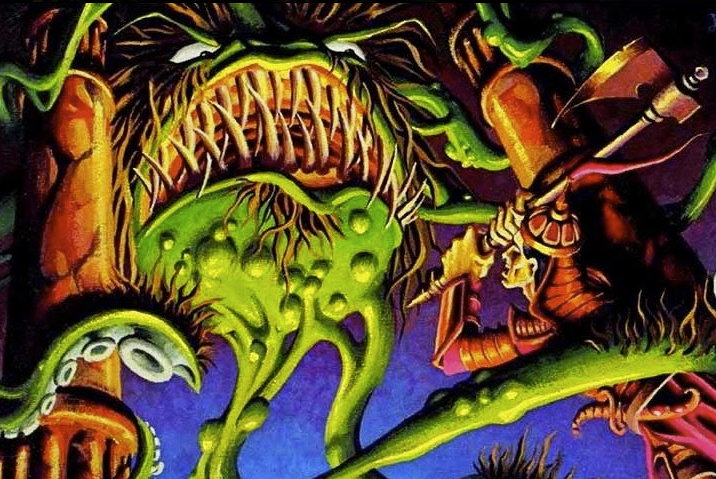 This concept found its way into the Star Control classic games lore and helped create a universe that felt well lived in. What made Star Control II so special? There are many answers to this question. I can only speak for myself. The "cute" art style of Star Control II contrasted nicely with the quite dark story. There is something unnerving talking to a seemingly pleasant alien whose theme song is "DIE! DIE! DIE!". Star Control II broke all the rules for a 1992 game. You played Star Control? Great. Guess what? You lost. The human race is stuck behind a slave shield. You discover that within minutes of the start of the game. In an age where every game seemed so happy, this was quite a change of direction. To put the innovation behind Star Control II's story in perspective, imagine if you went to see Star Wars: The Force Awakens only to learn that after Return of the Jedi the Empire had won and had killed the main characters. That's how startling the beginning of Star Control II was. It was unexpected. Nowadays, players are a little more jaded. But in 1992, the Star Control II opening was downright dark. Moreover, the "bad guys" of Star Control -- the Ur-Quan -- were actually the lesser of two evils. Their cousins, the Kohr-ah, weren't satisfied with merely enslaving everyone. They wanted to cleanse the galaxy. Some people consider Mass Effect a high budget remake of Star Control II. That should give you an idea of its influence. Stardock's own Galactic Civilizations II: Dark Avatar took inspiration from Star Control II as well. In that game, the primary villain, the Drengin Empire, had been victorious in the war against the Terran Alliance and its coalition. The Dregin's shock troops, the Korath, weren't satisfied with enslaving the enemies -- they wanted to exterminate them. Thus, when Galactic Civilizations III came along, several of the species from the previous game were gone -- exterminated forever. Mass Effect and Galactic Civilizations aren't the only games that Star Control II influenced. Many games today have a concept of Precursors. Was Star Control II the first game with the concept of an all powerful Precursor civilization? It's hard to say. Babylon 5 had "The first ones" but in terms of games, I am not aware of any game that touched on it before Star Control II. One of the greatest gifts ever to befall the gaming community was the creation of the Ur-Quan Masters. In 2002, 3DO's version of the game assets were turned over to the fan community allowing any fan to use the ships, source code, aliens, etc. as they saw fit, provided it was for non-commercial use. The result: The Ur-Quan Masters. And so, here we are, 25 years after the release of Star Control II. Happy anniversary!